Funding for Colorado Springs city parks has been pretty dismal (or worse) over the past few years, and the city does not have a weed management office. So control of these weeds has not been a high priority. However there two that I felt really needed to be given attention when I noticed them in the park, tamarisk and purple loosestrife. I first noticed tamarisk growing in the park a few years ago. It’s a shrub that can grow to 20 feet tall! (I’ve seen some about that tall along Fountain Creek at Fountain Creek Nature Center.) They are famously known for lining the edges of streams or rivers until they are just about the only species. Each plant can produce up to 600,000 seeds every year that it blooms! They germinate fairly easily in the moist soil of the streambanks, so populations grow rapidly. In the park, the first one I saw was in the northern part of the park. It was actually on higher ground, away from Monument Creek. I reported it anyway, and it was cut down several weeks later. Then last year, I noticed new growth from the stumps of that same plant. Additionally, new plants appeared in three other places – two of them right on the creek’s edge (one in the northern part of the park, the other in the southern part). I reported them to Colorado Springs Parks and Recreation late last summer and then reported the plants again to them and Colorado Springs City Forestry this summer. Within a week, City Forestry took care of the two clumps by the creek’s edge, and I met with them to point out the original one growing away from the creek. They treated the stumps with an approved herbicide, but the recent heavy rains may have diluted the effectiveness. Tamarisk is “only” a List B species, but given that these were the first I’d seen, I hoped it might still be possible to eradicate them from the park. As a List A plant, I knew that someone was required to eradicate it. I reported it immediately using the GoRequest app on my phone (an app that lets you report things directly to city government with GPS coordinates, photos, etc). 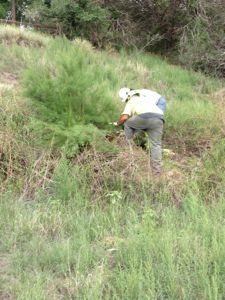 In nearly August, City Forestry and Parks and Recreation coordinated to cut down and treat the plant with an approved herbicide. Why is this plant such a problem? A mature plant can produce up to three million seeds per year, so it doesn’t take long to build up a huge seedbank in the soil, and some of the seeds will travel in the water to points downstream. These seeds can remain viable for up to 20 years, so we’ll have to keep this site monitored to see if any seeds were produced and dropped this year or possibly even in previous years.